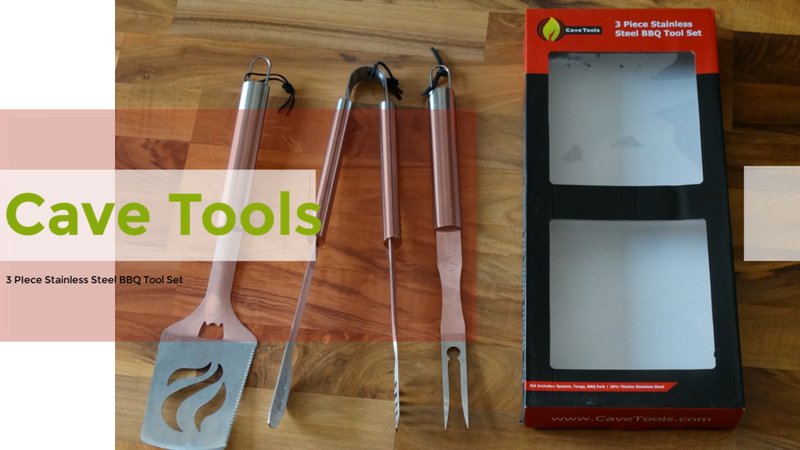 Cave Tools BBQ Grilling Tools Set which is made from 20% heavy duty thicker stainless steel is the perfect accessory to your grilling or smoker collection. The three piece utensil set is professional grade that includes a fork, spatula and tongs. It's affordable too and makes a great birthday or Christmas gift! We used our's first with the smoker as with thicker cuts of meat, you really need heavy duty dependable utensils to avoid dropping it or causing an accident if it breaks. Not only is the spatula convenient for flipping over anything that requires turning, but it's also a bottle opener that is perfect for tailgating or maybe even adding your favorite brew as a marinade for the smoker. It's also oversized for even the larger cuts of meat such as steaks. The grill tongs are not the ordinary type you purchase in the store as they have six teeth to help grip the hot dogs or brats. 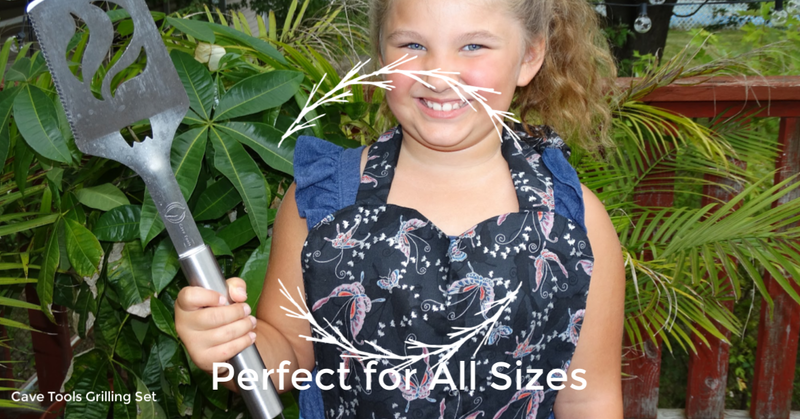 Each utensil has a extra wide hooks for hanging up in between usage or even while using them with the grill or smoker. She rinsed the spatula off so please excuse the water spots! They were very easy to clean up and are dishwasher safe. Not only do you get the beautiful set of utensils but you also get 25 barbecue recipes as a free download. There is also a lifetime warranty which I'm sure we will test out as we grill and smoke out a lot! As always, Cave Tools provided the very best products with no complaints from us! I did note a question/answer comment for this on Amazon stating the tools might be too heavy for a woman which I completely disagree with. I picked them up and used them and had no issue as well as my seven year old granddaughter! They would definitely make a great gift for the tailgater, for Father's Day or even Christmas since it's coming upon us pretty fast! They were a hit with my son-in-law who does most of the grilling and all of the smoking. He also uses the Cave Tools Instant Read Digital Thermometer (click to see the review) every time he cooks. Use GRILLSET15 for 15% off! 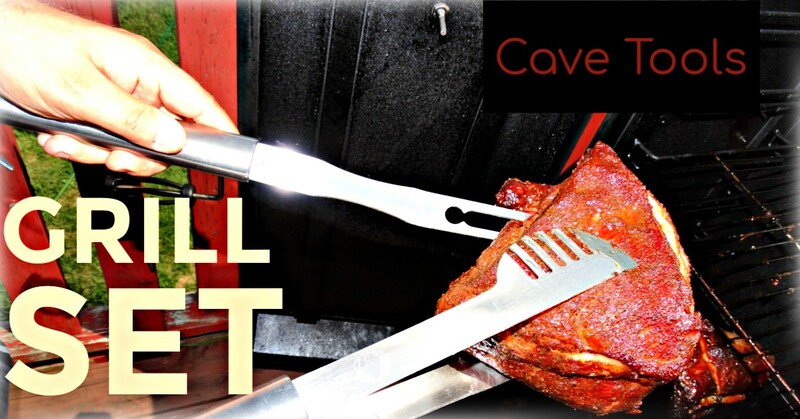 Click here to purchase and to learn more about Cave Tools BBQ Grilling Tools Set to learn more! Click here to see our review for the Meat Claws which is a must have for any grill or smoker master!